It's fitting that Lexicolatry has arrived at Braille now, as it coincides with National Braille Week in Britain, running from 7th -13th October 2013. As a system of writing, it's impossible not to marvel at Braille and its inventor, Louis Braille. Blinded in an accident as a child, Braille was initially educated in a standard school and, despite the assumption that his blindness would hold him back, he excelled and was awarded a scholarship to the Royal Institution for Blind Youth in Paris. At the time, printed material existed for the blind, but it consisted of standard Latin letters raised from the page that were very difficult to distinguish. Braille became aware of the work of Charles Barbier de la Serre, a soldier who had developed a system of raised dots known as night writing (or sonography) in response to Napoleon's call for a code that soldiers could read in low-light. Within three years, by the age of 15, Braille had refined this unwieldy military system into what is known as Braille today, using a system of six-dot cells to represent letters and words. 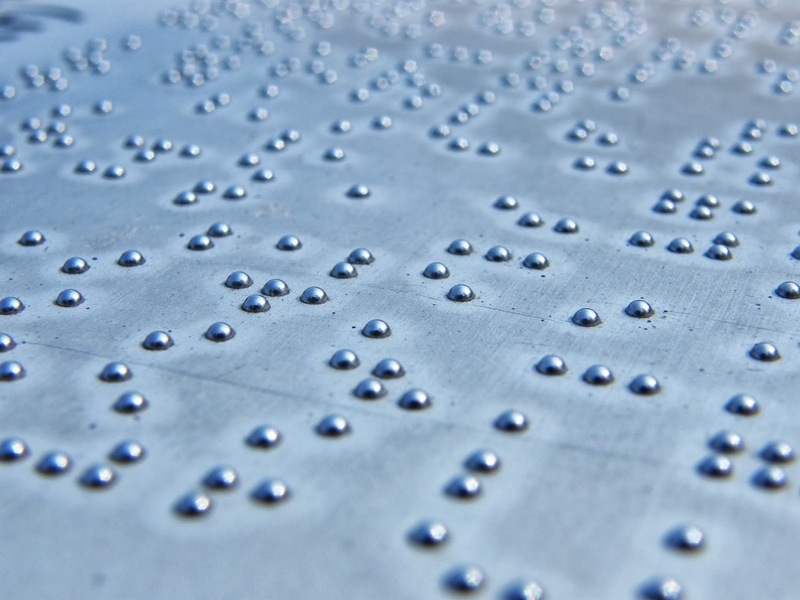 Although the adoption of Braille was initially slow, its elegance and utility was increasingly recognised in the years following Louis Braille's death in 1852, and its use continues today as the primary means of allowing blind and partially-sighted people to read. Braille symbols are formed from units known as cells. A full cell has six raised dots in two vertical columns of three. The various combinations of between one to six dots are used to represent letters of the alphabet, symbols, or even whole words in a form of shorthand. Braille includes symbols to represent punctuation, scientific and mathematical symbols and musical notation. Braille readers that are not visually impaired (such as teachers and parents) can read it with their eyes. 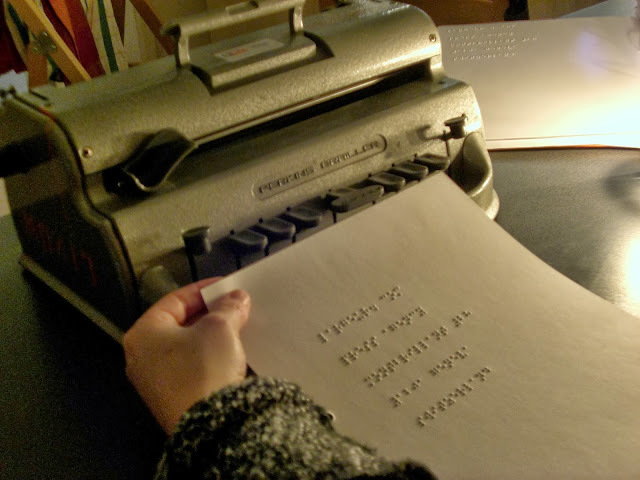 There are a number of different methods for writing Braille. By hand, it's done with a slate that has evenly spaced depressions for the dots of the cells. A piece of paper is placed on the slate, and a stylus is used to press the impressions into the paper. Thus, a user can quickly take notes, write letters and do everything else that a person with pen and paper can do. Braille can also be written with a braille writer, a machine like a typewriter but with only six keys (one for each dot) and a space bar. As any combination of keys can be pressed simultaneously, it can create any symbol within the six-dot system. Braille has been a vital resource to blind and partially-sighted people, allowing them access to education and intellectual independence, as well being critically important in employment and personal security. Do you have any experience with Braille? Wow, a typo in the video, on the "thank you" section at the end. It reads "thayk you" because of the extra dot six where the "n" should be. Yes, I am a braille nerd. Ah! The ubiquitous typo, scourge of every written medium known to man! Thanks for pointing it out - and a great site you have there. I have always admired the young man who came up with this extraordinary means of communication for the blind. He really seems to have been a bit of a genius. I suppose someone has already invented a computerised pinboard (like the sort of thing with which one can make amusing sculpture of one's nose) to produce a sort of braille ebook, haven't they? If not, then I thought of it first, OK? OK - Sally Prue thought of it first. If someone had such an electronic device, would they not just plug some earphones in and listen to the book?